Sweet shots! I love watching the birds at my feeders. The top bird is actually a female Junco referred to as a "Slate- coloured Junco". You can tell a Junco from a sparrow by the pink beak. How absolutely precious, what a treat to see these little cuties. Thanks, Icy. Such pretty birds and lovely shots. 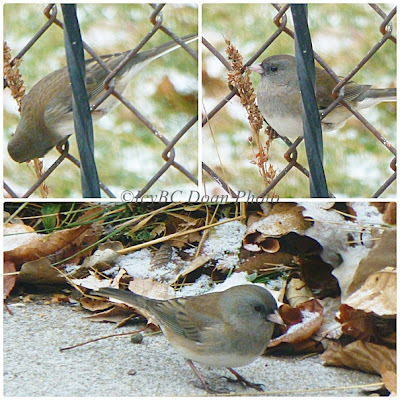 Cute shots of the Junco and the chickadee. They are both beautiful birds. Have a happy weekend and thanks for linking up. Lovely photos of th birds. I agree that watching birds at a feeder is tons of fun. We know winter is approaching when the juncos return to our yard. I'm glad I'm not the only one that gets excited (a hawk for me) and ends up with a blurred photo. Enjoy your feathered friends at the feeder. i love those little juncos. so cute! Isn't it great when bloggers help you with IDs! Your birds are adorable...lucky they are to have you. I've not seen a gray headed sparrow. Do consider adding the link to your post at the Bird D'Pot!! You've shared some awesome dinnertime photos here. Those are some cute birds. They look quite content with your offerings!